Another Brit import entered Stateside airwaves in late 2006 and early 2007, ushering in a new form of music, “new rave”. 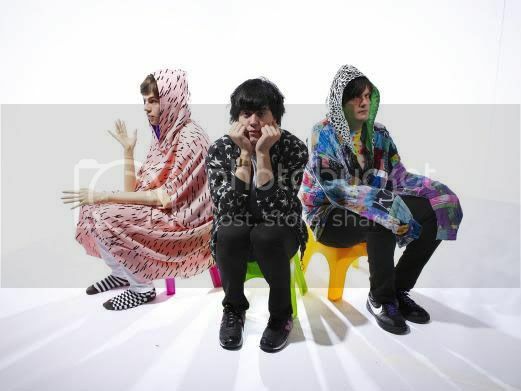 The Klaxons have managed to infuse elements of electronica, disco, and punk with tales of fantasy and the supernatural on their 1st album, “Myths of the Near Future” (released in January ’07 in the U.S.). The album was highly revered in their homeland, entering the UK charts at #2, and is building steam indie circles abroad. Their success was sure to only continue with a schedule tour of the U.S., but has reportedly derailed due to problems obtaining visas. The first single I heard, the disco anthem “Golden Skans”, and all of the hype made me very intrigued for the rest of the album. “Myths of the Near Future” has some stand out tracks that feature heavy bass lines (“Gravity’s Rainbow”, “As Above So Below”) mixed with catchy futuristic hooks (“Golden Skans”) and creepy love stories (“Isle of Her”). Unfortunately, the rest of the album tries to cover too much ground at one time. “Four Horsemen of 2012” awkwardly sets the stage for a freaky apocalypse, while “Atlantis to Interzone” tries to mash-up techno with surf rock unsuccessfully. It sounds like an emergency system programmed by a raver being backed by a cult-choir. Either way, the Klaxons are very much worth checking out. When they are inspired and focused, they are stellar. When they have a barrage ideas, they leave songs that sound like a garbage truck full of instruments. Hopefully, more experience will make the The Klaxons more than ‘Myths’.